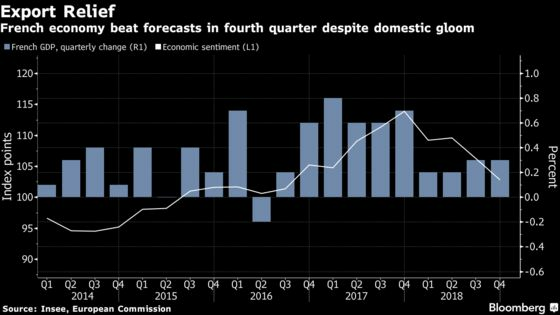 (Bloomberg) -- A surge in exports covered up a disappointing domestic performance by the French economy at the end of 2018 as the Yellow-Vest protests disrupted consumer spending and investment. With external threats hobbling Germany’s economy, the country is relying on domestic demand. Consumer confidence has risen for two straight months. At the same time, a gauge for manufacturing signaled contraction at the start of 2019. While France’s fourth-quarter performance left 2018 growth at 1.5 percent, that’s a sharp slowdown from 2017’s 2.3 percent. The economy is forecast to post another 1.5 percent rate this year. Private consumption -- the engine of France’s economy -- didn’t increase in the final quarter, and investment growth slowed to 0.3 percent from 1.7 percent.